When I first entered the work force after completing high school, I caught the train to and from work in the city each day. That meant that I passed through this railway station twice daily for years, sitting in a "red rattler" along with hundreds of fellow commuters. Passengers sat on long cross benches, touching knees with those opposite. Those that couldn't find a seat stood - thereby making the journey even more uncomfortable. In my school days, these carriages were towed behind steam engines, but they were later (thankfully) replaced by diesel engines. Now Queensland Rail is electrified. 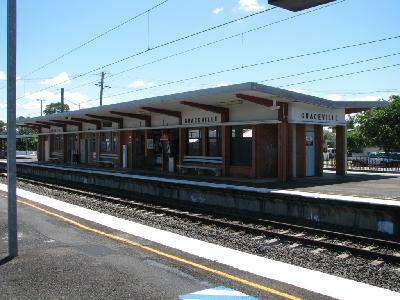 The Graceville Railway Station, situated on the Brisbane - Ipswich line, was first built in 1884 as the former pastoral land in the area was being converted to housing allotments. That station was replaced in 1959 as part of the quadruplication of the line between Brisbane and Ipswich. The new station was designed by Polish-born, German-educated Jan Kral, an architect with Queensland railways. "It has not been listed because of its longevity – the rail line has gone through Graceville since the mid 1870s – but rather for the modernist 1950s design. "Graceville Railway Station was part of a new wave of Modernist architecture experimented with throughout Queensland as post-war austerity gave way to economic prosperity. "The butterfly-roofed platform awnings, terrazzo tiles to the waiting room and ticket hall floors, painted steel balustrade to the stairs leading from the subway, the terrazzo window sills, timber and concrete seating, tiled subway walls: these were all a deliberate departure from the traditional railway station design and was considered an exemplar. Now it’s the most original of its vintage between Corinda and Nundah." Here are a couple of photographs of the Modernist building. More recently, the local member of parliament noted that the railway station had been allocated a budget of $900,000 for renovations that will include lifts, overhead bridges and a park-and-ride. They'd better be careful! That's great to hear Katherine! I have another old house that you might like to go look at before it is sold. The Wilderness is at 12 Tarragindi Rd, Tarragindi and according to the marketing blurb dates from the 1890s. Did a little bit of research on computer via Trove and NLA and there are references to the property from this time but interestingly talking about the area as South Brisbane. What is interesting is that it appears not to have been restored and must be heritage listed!